It’s easy to put something out on social media and forget exactly how far reaching your actions can be. But yesterday one girl had an extreme reminder that there’s a time and a place for inappropriate jokes, and Twitter definitely isn’t it. A Twitter account supposedly belonging to a 14 year old called Sarah blasted this seriously inappropriate tweet into the twittersphere: “@AmericanAir hello my name’s Ibrahim and I’m from Afghanistan. I’m part of Al Qaida and on June 1st I’m gonna do something really big bye”. 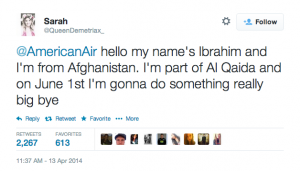 She then received a reply from American Airlines saying they would report her IP address and details to the FBI; at which point she freaked out that her parents might take her Twitter account away from her (I’m not sure if they allow Twitter in prison, so it may be a moot point anyway…). Considering her twitter feed is apparently full of messages to Demi Levato (it’s been suspended though so I’m afraid Demi will never know for sure), and that she insisted that she was joking afterwards, she probably isn’t an international threat; but obviously the airline still had to treat her as one. It’s a serious reminder that though we may sometimes feel like we’re performing these social dances in our own little friend bubble, we’re actually broadcasting to the world – and whilst at one time our social faux pas were merely fodder for passing ridicule, now you’re one screengrab away from eternal mortification. If you’re worried about the things that you post being taken the wrong way, or want to have slightly more freedom to say what you like, set your social accounts to private (though you might want to rethink any impulses to tweet bomb threats to an airline, either way). If you use your social accounts for more professional purposes, it’s better to keep it clean; but otherwise Twitter, Facebook, Instagram and all the things should probably just be kept between you and your slightly inappropriate side!